I didn’t feel very well-rested after the night with scolopendra, but we continued our journey anyway. 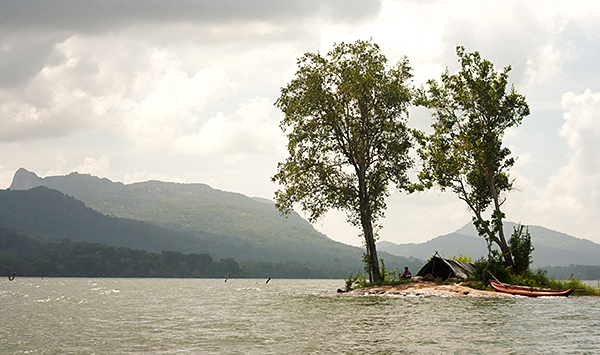 Our next goal was Gal Oya National Park and boat safari. Unfortunately, when we arrived it turned out that we should have booked the trip a week in advance and all the boats were already rented. Only thanks to the help of a Sri Lankan family who took us with them we managed to make the trip. The father of the family thought it would be nice for his daughters to practice English and they were very content with that. Of course, we were content as well. You can say that this park had the smallest number of animals and it was mostly birds, but it still was a very interesting experience for us. Soon we reached a small island, around 500-600 m2 where around 1000 birds lived, both adoults and recently hatched chicks of ibes, herons, night herons, cormorants, and many other. 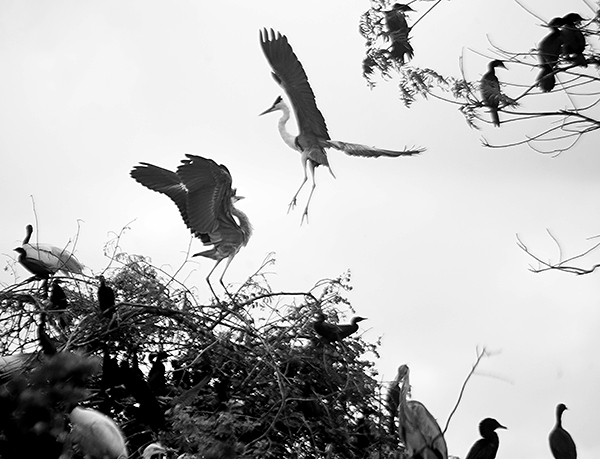 It was madness, we saw grey herons fighting for a place on a branch and six white-bellied sea eagles nearby. 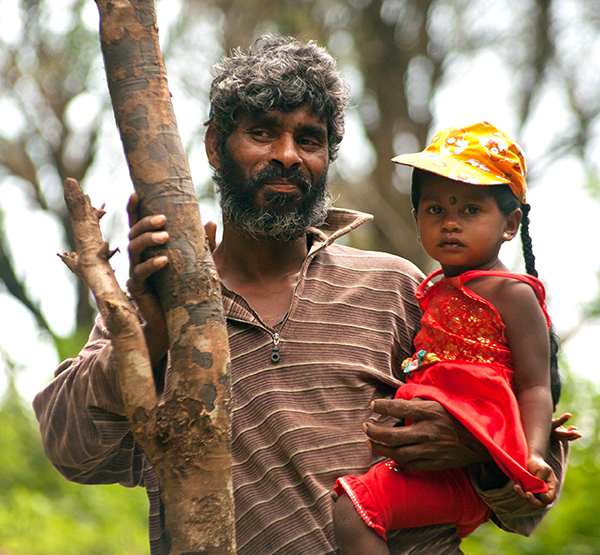 The father of the family who helped us was a very religious Buddhist and after visiting the park he planned to take his family to a place where monks learn, meditate, and live – Buddhangala. We decided that it could turn out to be a compelling adventure so we went along with them. If we travelled alone I believe we wouldn’t have been able to see what we saw thanks to the family. After a long chat between the father of the family and the monks one of them was assigned to us as a guide. 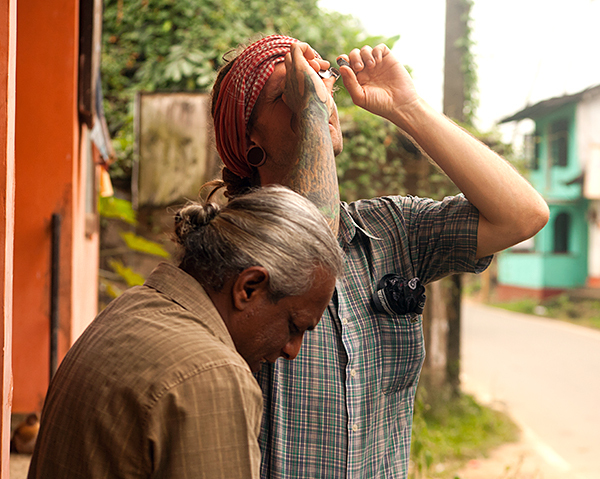 He showed us the places where they live (although we weren’t allowed to look inside) and meditate. He told us a bit about himself and the main principles of Buddhism. It was very interesting. We shared dinner with the family and it was time to say goodbye. 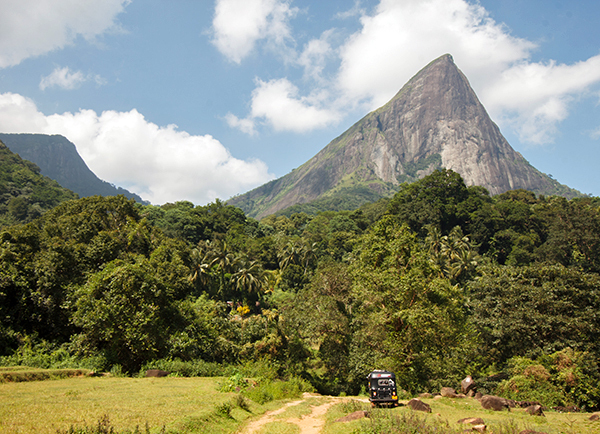 From the coast we moved to Gal Oya National Park. Gal Oya. M. Komorowski photo. 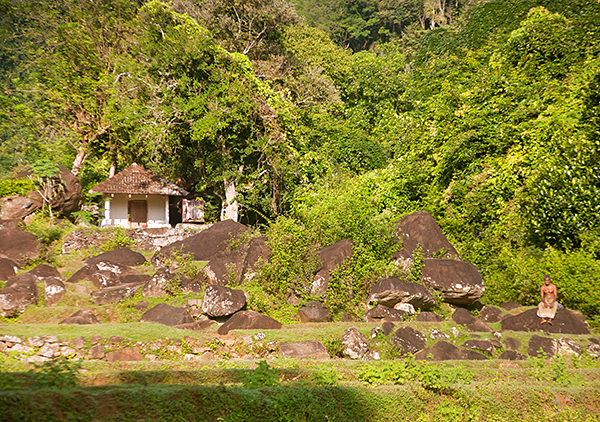 Gal Oya National Park. A. Bryja photo. 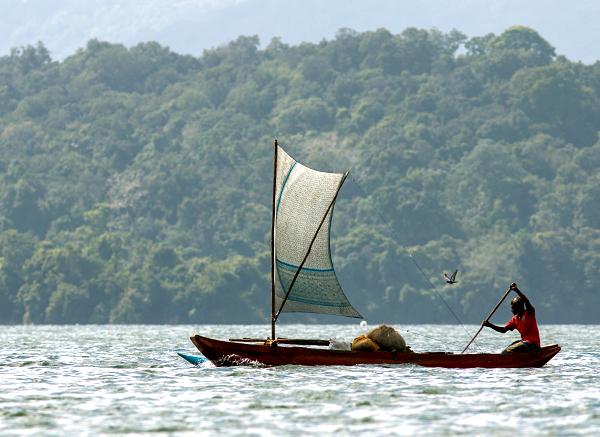 Boat safari with a local family in Gal Oya. A. Bryja photo. 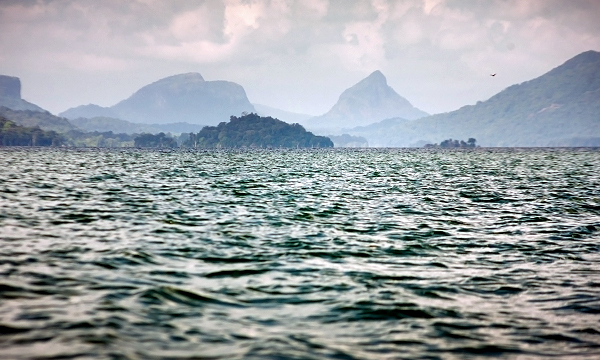 Boat safari with a local family in Gal Oya . M. Komorowski photo. 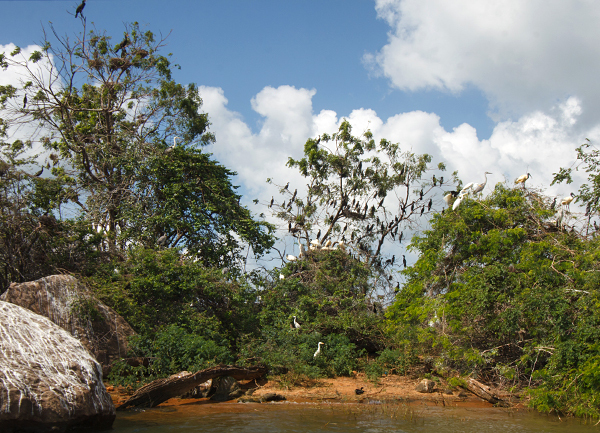 Numerous birds in Gal Oya National Park. M. Komorowski photo. 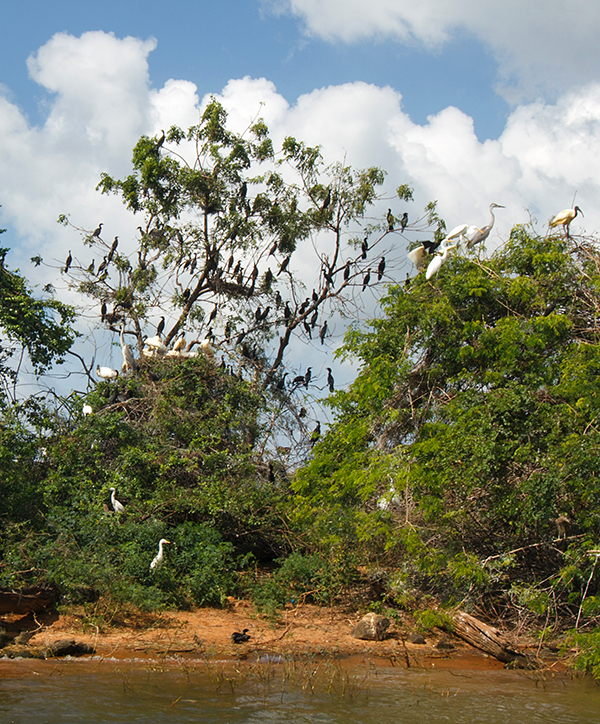 Grey herons in Gal Oya National Park. A. Bryja photo. 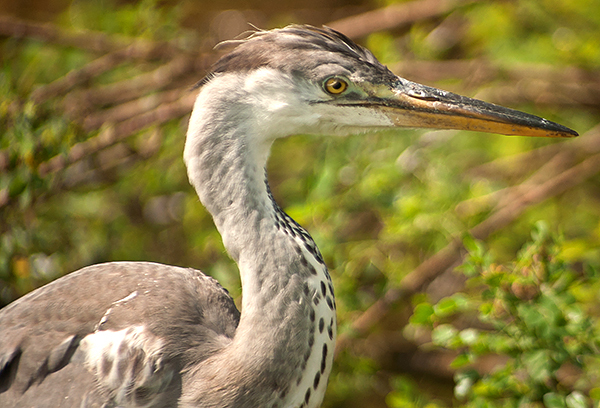 Grey heron, Gal Oya Park. A. Bryja photo. 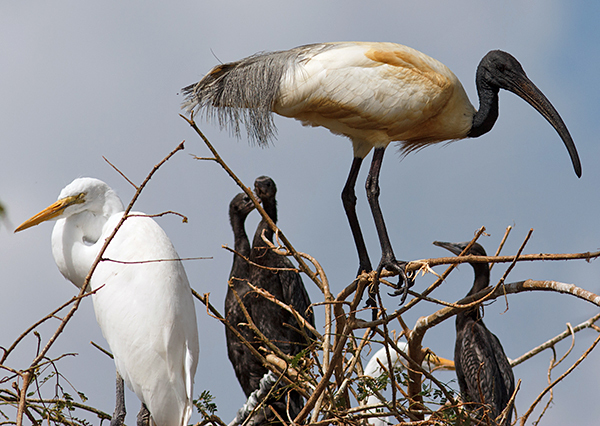 White Ibis, Gal Oya Park. M. Komorowski photo. 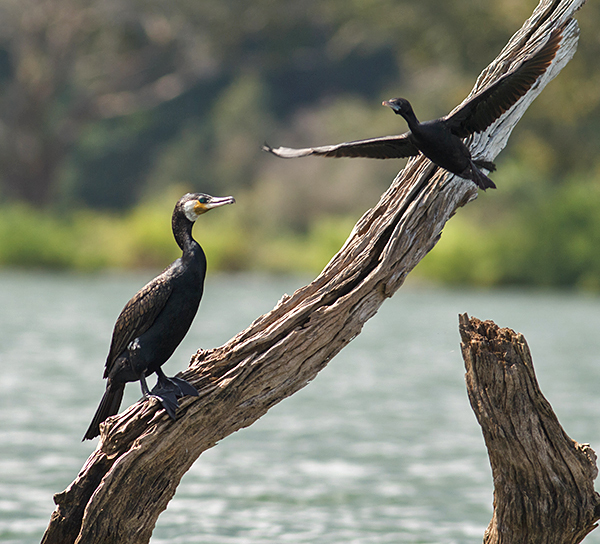 Great cormorant, Gal Oya Park. M. Komorowski photo. Black-crowned night heron, Gal Oya Park. M. Komorowski photo. 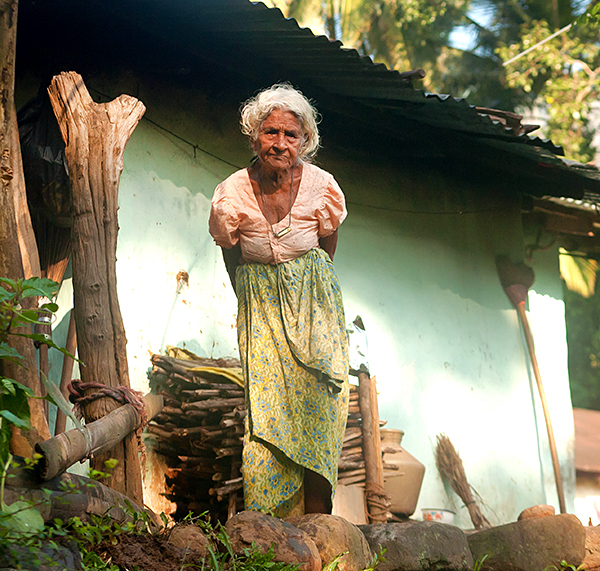 After the visit in Gal Oya we joined our new friends on their trip to Buddahangala. Monk in Buddhangala, unfortunately we were not allowed to take the pictures in the monastery. A. Bryja photo. 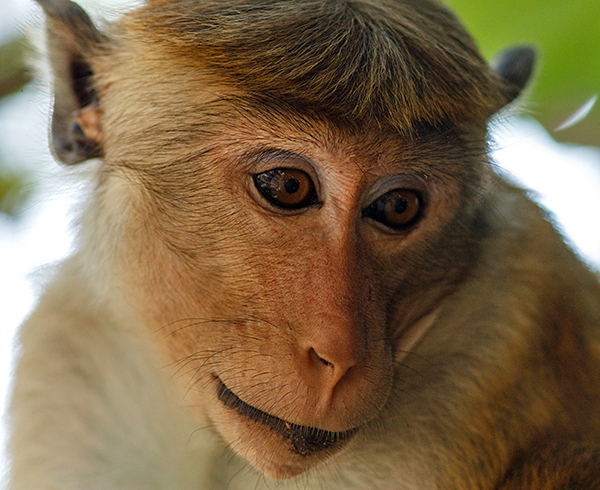 Macaca sinica, Buddhangala. M. Komorowski photo. 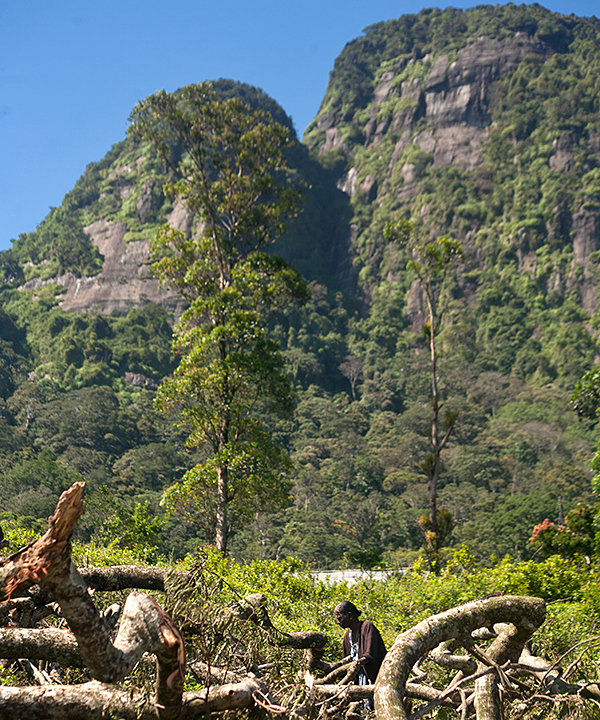 After the very interesting visit in the monsastery we had to continue our journey and to decide whether to go to Adam’s Peak and World’s End (very popular destinations visited by most of the tourists) or see the Knuckles Range where, according to the guide, tourists usually don’t go. 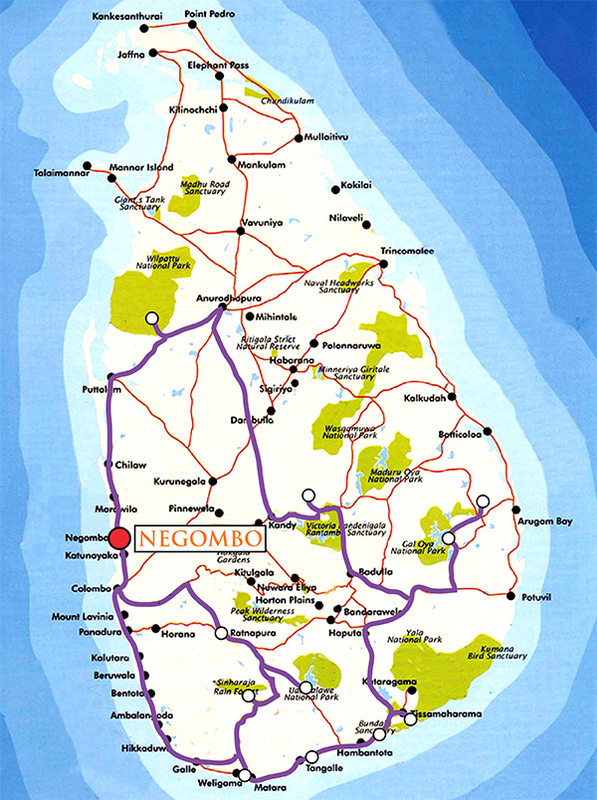 We chose the latter and after a short talk with a local in the bus we were told that we needed to reach Hunnasgiriya and from there Meemure whis was located around 33 kilometers from there. 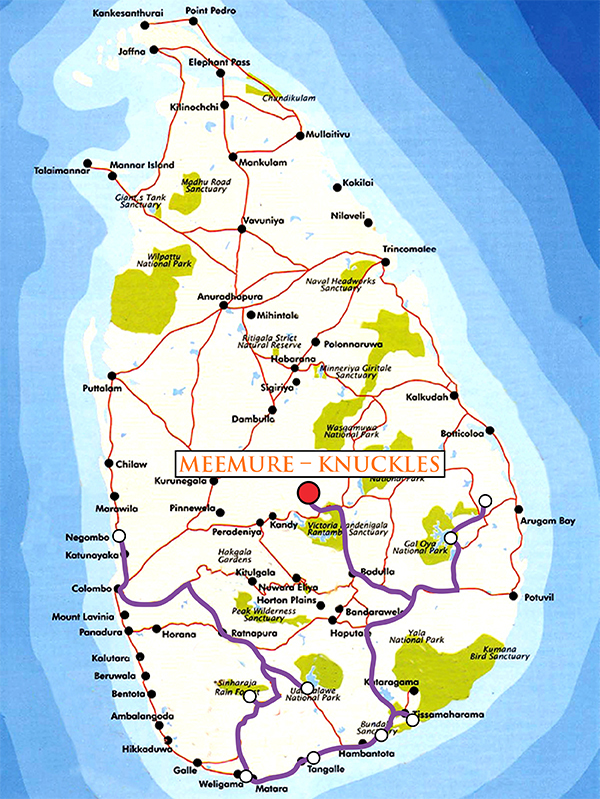 We reached Hunnasgiriya in the night and in the morning we set off to Meemure. It turned out that the only van goes there at 2.30 pm, and it was only 9 am so we decided to walk through the mountains. We managed to catch 3 cars, every one of them took us for a few kilometers. The rest of the road we went on foot. We got there in the evening, very tired but content as we saw lots of interesting birds along the road, usually hard to notice, the shy langurs and beautiful landscapes. We ate a wonderful dinner with a local family and left for the mountains in the morning to reach the highest peak called by the locals “Lakigalie”. Our guide told us straight away that climbing the top was forbidden as around a week before some tourists had suffered a serious injury, but we wanted to get as far as possible. The road didn’t seem hard in the beginning (except for not really dangerous but annoying leeches) because it led through a path in the jungle. Only after reaching about 1/4 of the height the jungle, as well as the path ended. From that moment a steep climb started along wet, slippery rocks and spiny bushes. It was a torture for our recently tanned arms and legs. As our guide said, when we reach 4/5 of the mountain we had to go back. The last part was indeed very steep and looked dangerous, despite that our guide walked around in flip-flops which was one of the reasons to give up further walk. 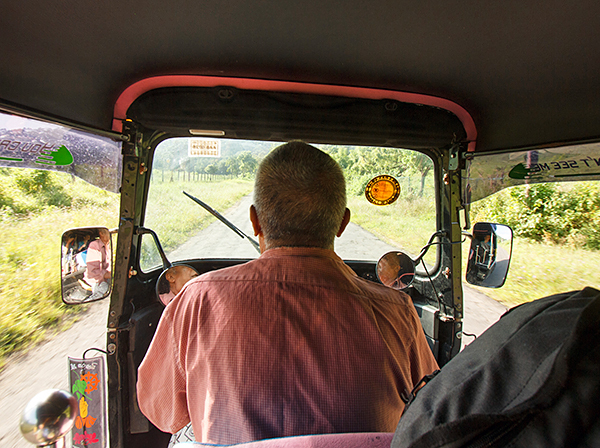 On the road back to Hunnasgiriya we hired a tuk-tuk as we felt too tired to come back on foot. We had a few problems anyway as the road was being renovated and no one could drive through it. Our driver, some locals, as well as ourselves were forced to carry the three-wheeler through the part where road was closed. Fortunately, we managed to do it and continued our journey. Time to see the mountains - road to the Knuckles Range. 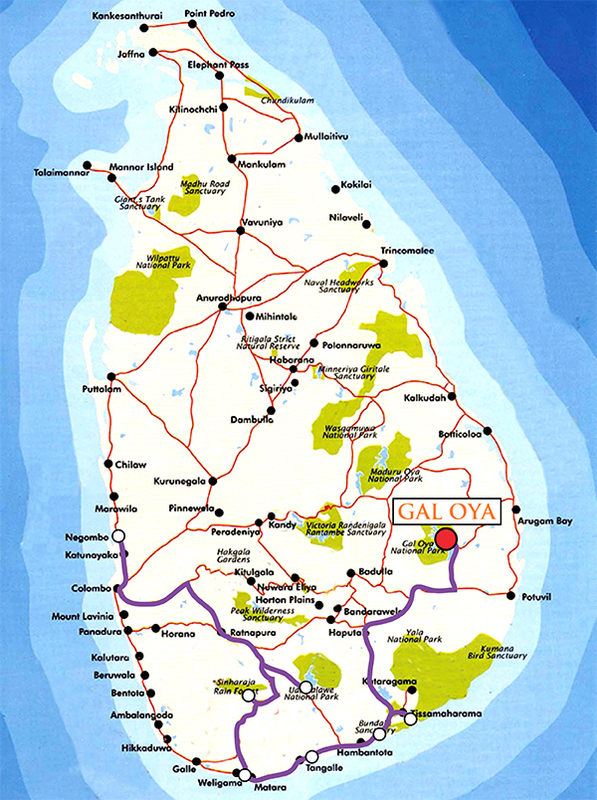 Hunnasgiriya town. A. Bryja photo. 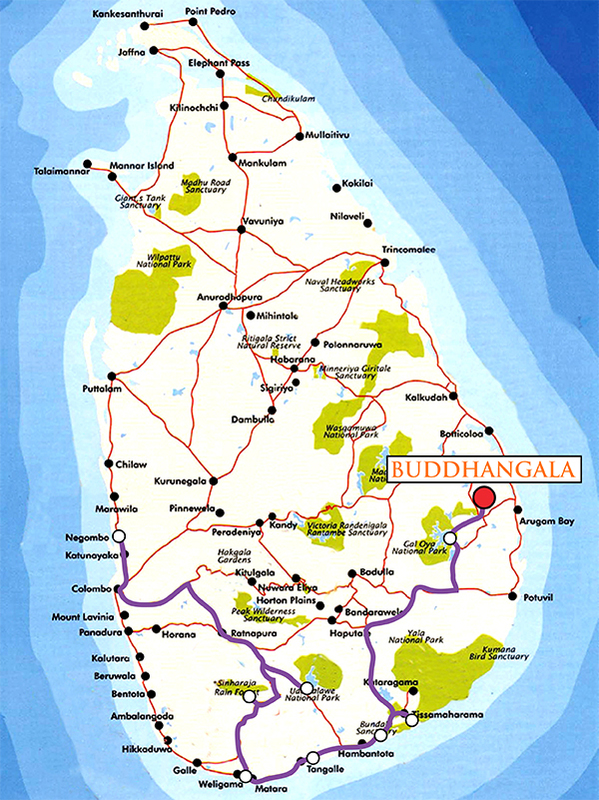 Hunnasgiriya town. M. Komorowski photo. 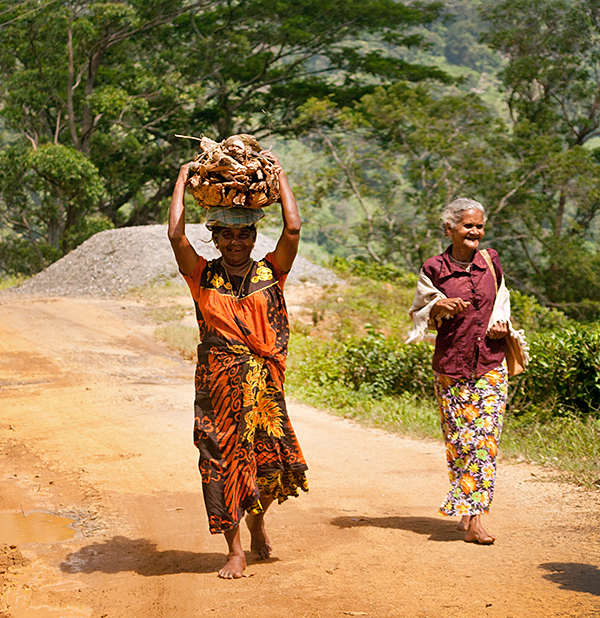 Walk from Hunnasgiriya to Meemure, we met a lot of friendly people. A. Bryja photo. 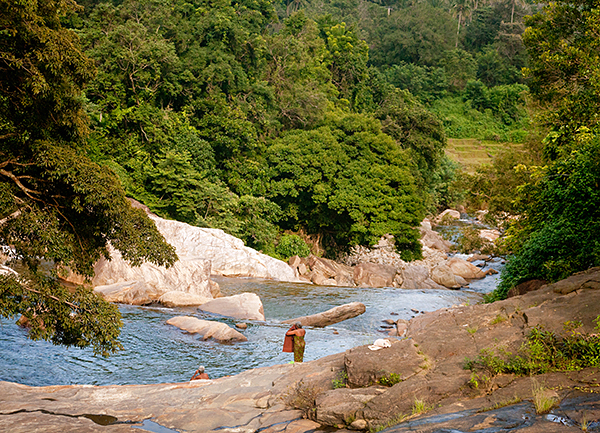 Walking from Hunnasgiriya to Meemure. A. Bryja photo. Kids in Meemure. A. Bryja photo. People of Meemure. A. Bryja photo. People of Meemure. M. Komorowski photo. In the Knuckles Forest Reserve. M. Komorowski photo. 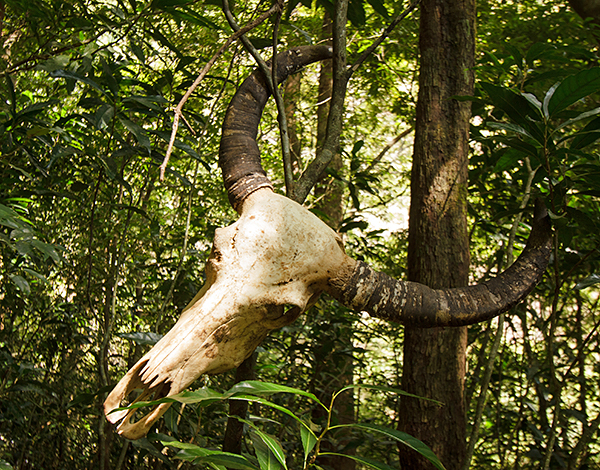 In the Knuckles Forest Reserve. A. Bryja photo. 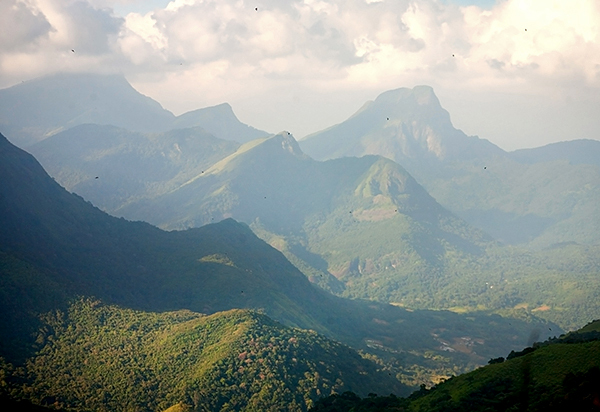 Hiking in the Knuckles Mountain Range. M. Komorowski photo. 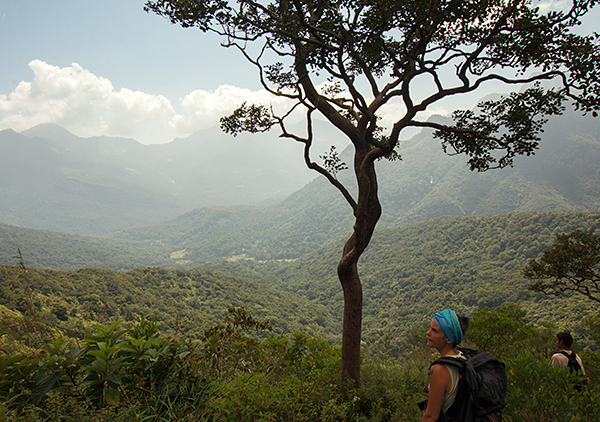 Hiking in the Knuckles Mountain Range. A. Bryja photo. 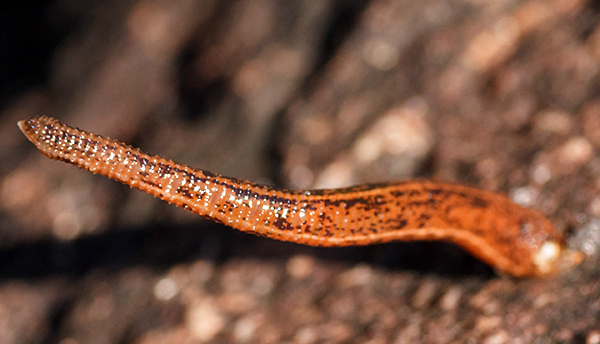 We met a lot of leeches along the way. M. Komorowski photo. Commander, Knuckles Forest Reserve. M. Komorowski photo. 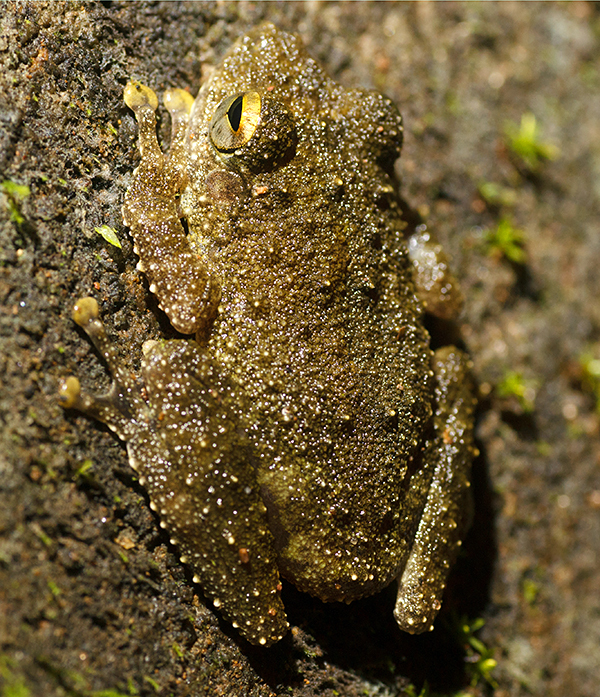 Common shrub frog, Knuckles Forest Reserve. M. Komorowski photo. 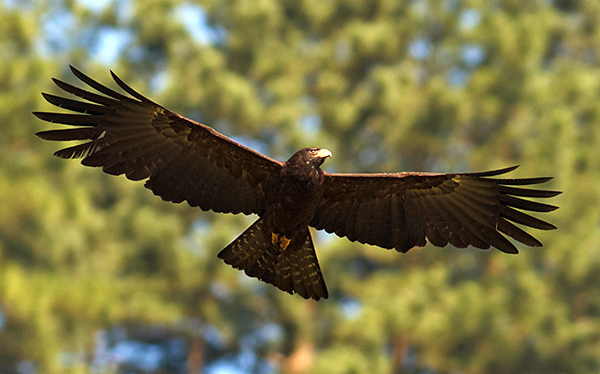 Black eagle. M. Komorowski photo. 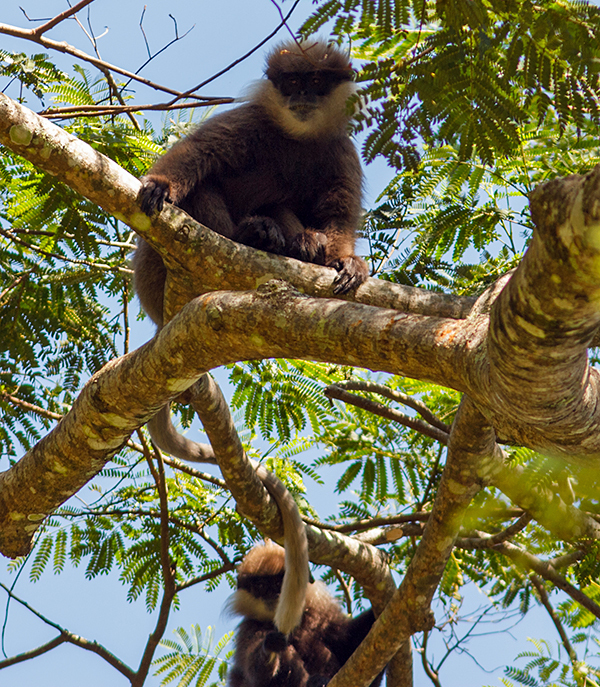 Montane purple-faced langur, Knuckles Forest Reserve. M. Komorowski photo. 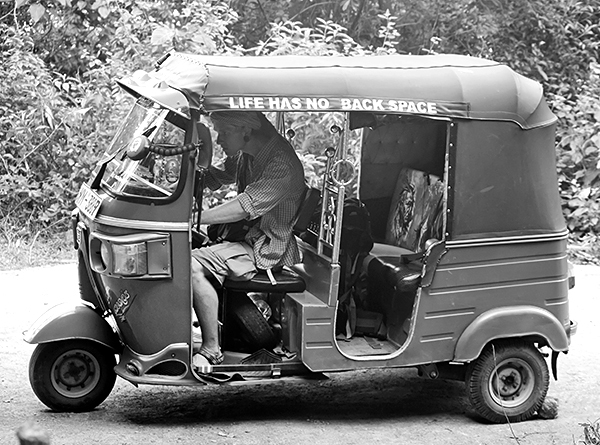 We were too tired to go back on foot so we took a tuk-tuk. A. Bryja photo. 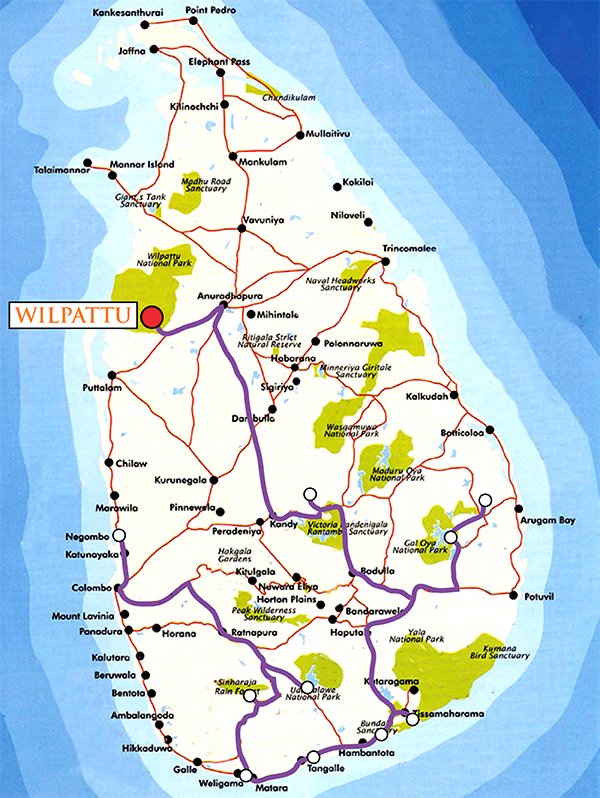 As our trip was soon coming to an end we decided to make Wilpattu our last national park visit. 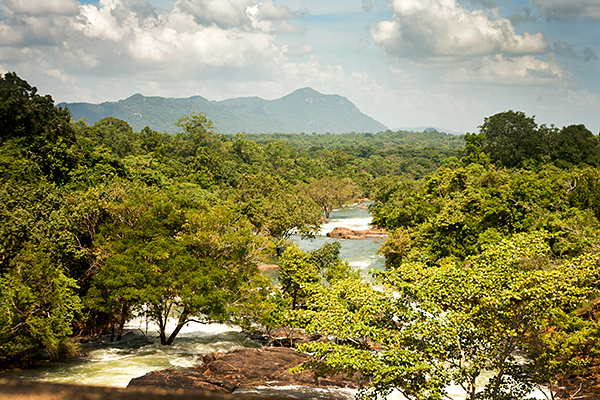 According to the guide it was the second after Yala (the most popular National Park in the country) park to observe bears and leopards. 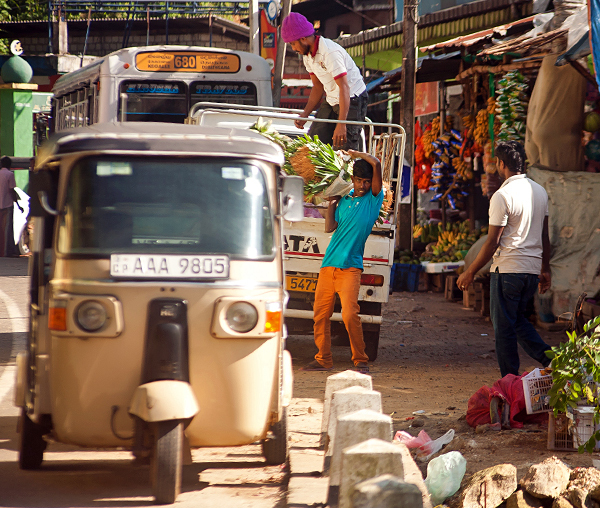 Supposedly there were also less visitors than in Yala (only a few cars a day). 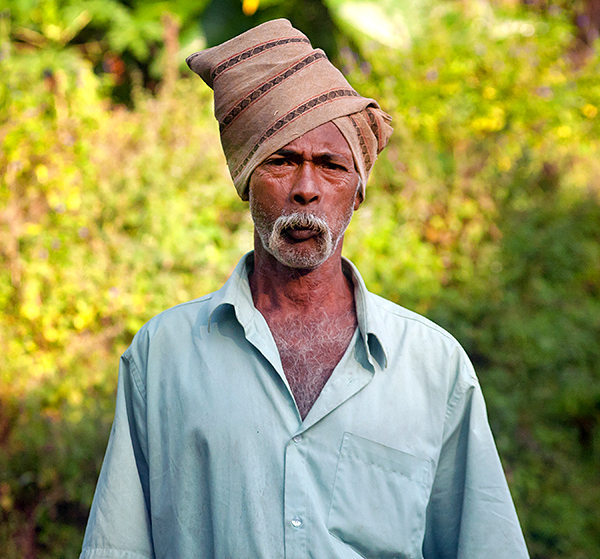 It turned out to be only partially true – just about a kilometer from the gate there was a leopard lurking in the bushes. The news went around quickly and before we reached the place there were 10 cars already and after five minutes you could see more than 30 of them. We didn’t manage to see the leopard as only the first had the luck to see it and we were stuck in a traffic jam for more than an hour. We didn’t have luck for the guide either, and most of the animals we noticed ourselves: bee-eaters, hog deers, muntjacs, jackals and just in the end, when everyone was gone we saw a leopard resting or hiding from the tourists in the bushes. 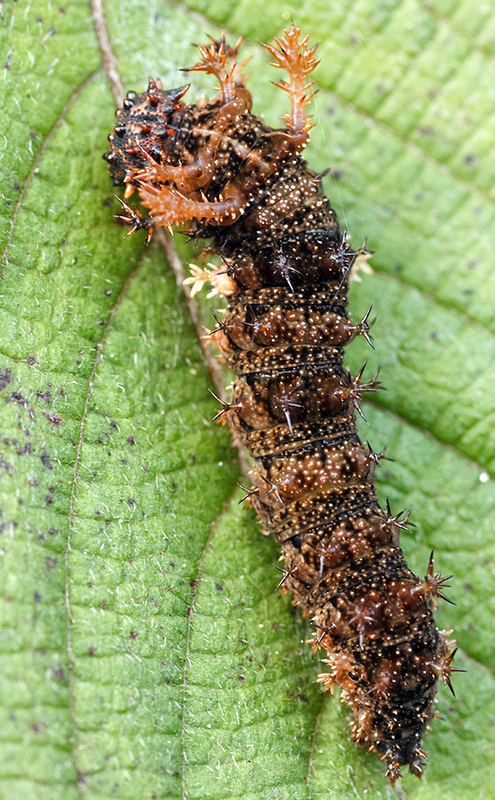 It wasn’t too active and spent most of the time lying hidden behind the leaves. The last national park we visited - Wilpattu. 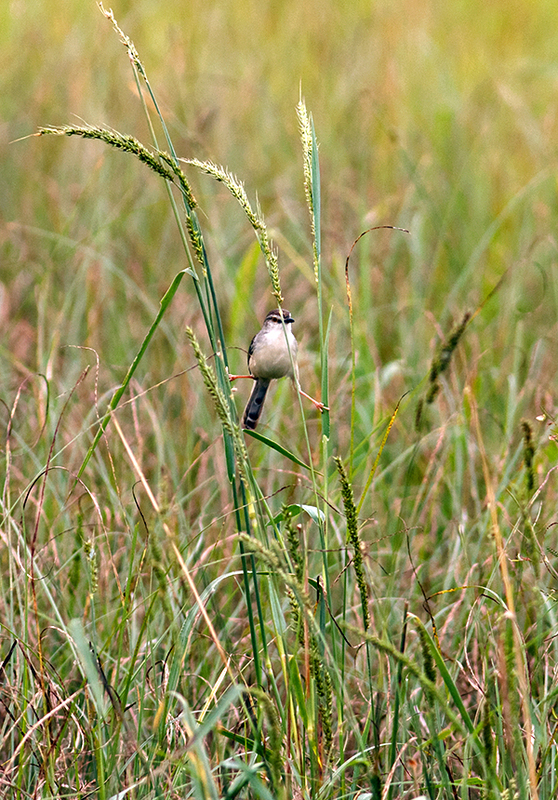 White-browed prinia, Willpattu Park M. Komorowski photo. 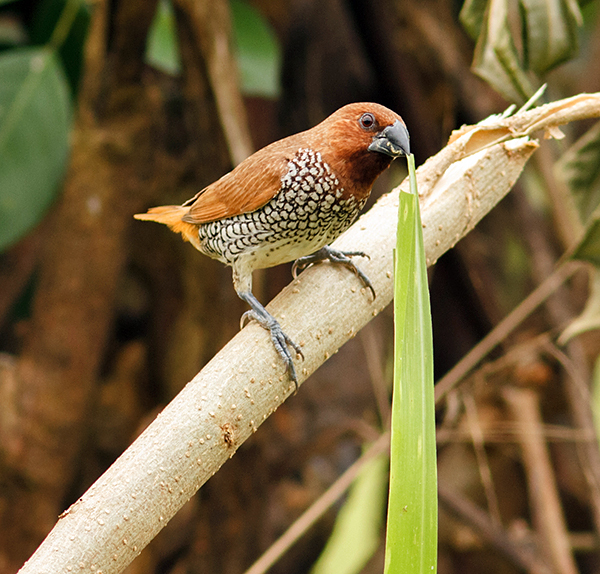 Spotted munia, Wilpattu Park. M. Komorowski photo. Chestnut-headed bee-eater, Wilpattu Park. M. Komorowski photo. 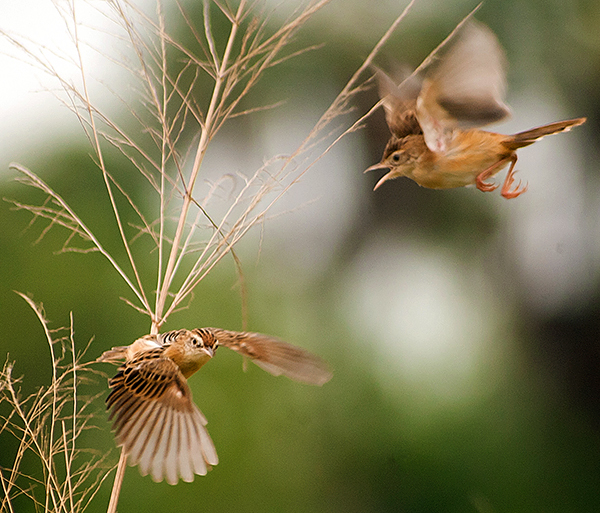 Streaked-Fantail Warbler, Wilpattu Park. A. Bryja photo. 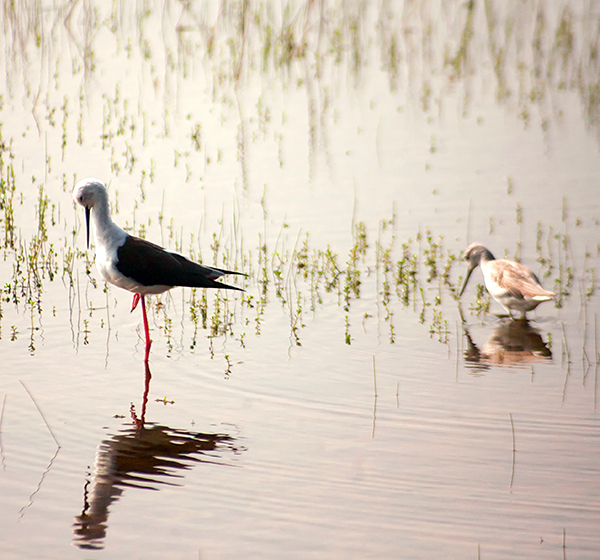 Black winged Stilt, Wilpattu Park. A. Bryja photo. 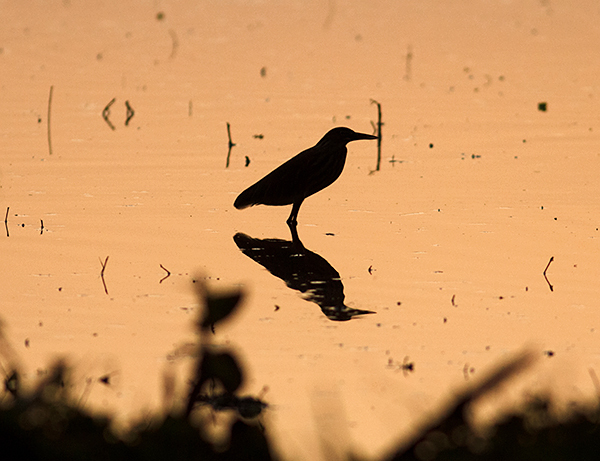 Indian pond heron, Wilpattu Park. M. Komorowski photo. 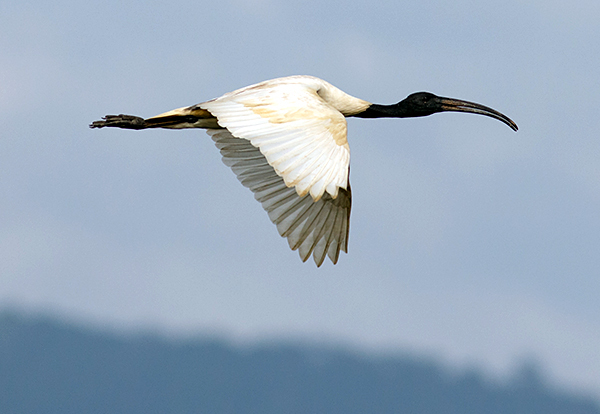 White-necked stork, Wilpattu Park. M. Komorowski photo. 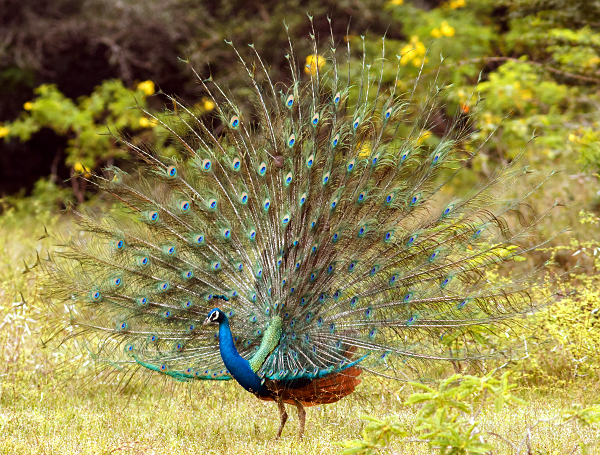 Indian peafowl, Wilpattu Park. M. Komorowski photo. Malabar pied hornbill, Wilpattu Park. M. Komorowski photo. Grizzled giant squirrel, Wilpattu Park. M. Komorowski photo. 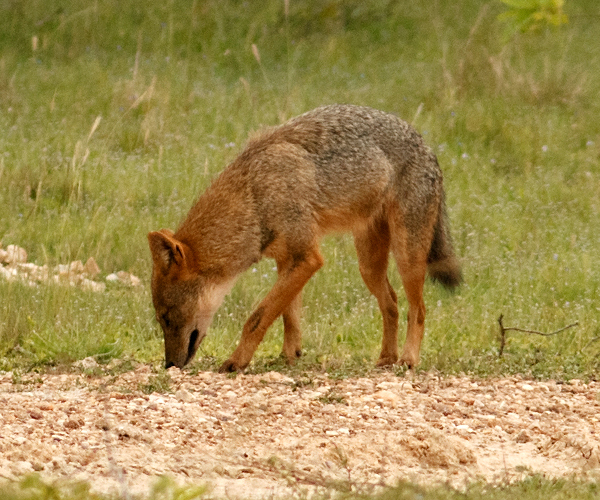 Sri Lankan jackal, Wilpattu Park. M. Komorowski photo. Indian muntjac, Wilpattu Park. M. Komorowski photo. 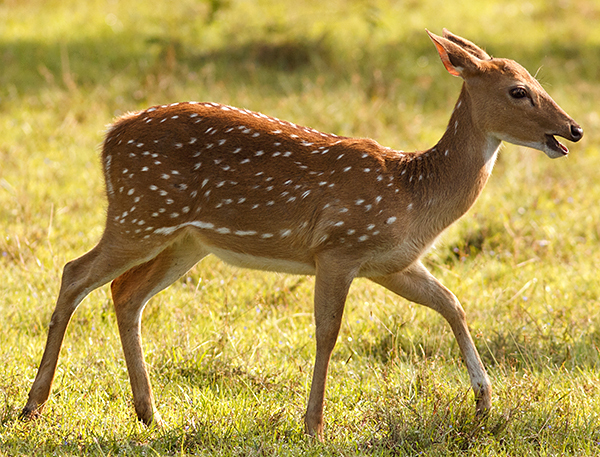 Spotted deer, Wilpattu Park. M. Komorowski photo. 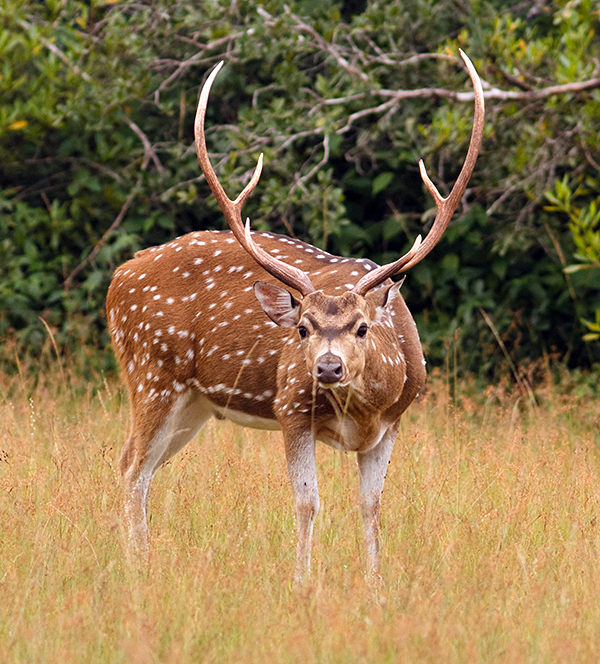 Spotted deers, Wilpattu Park. M. Komorowski photo. 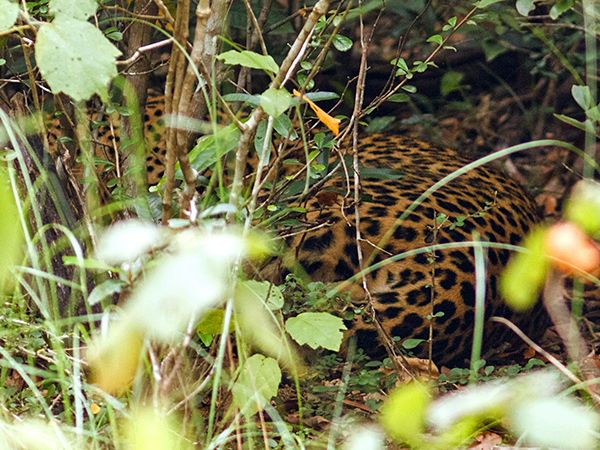 Sri-Lankan leopard hiding in the scrubland, Wilpattu Park. M. Komorowski photo. 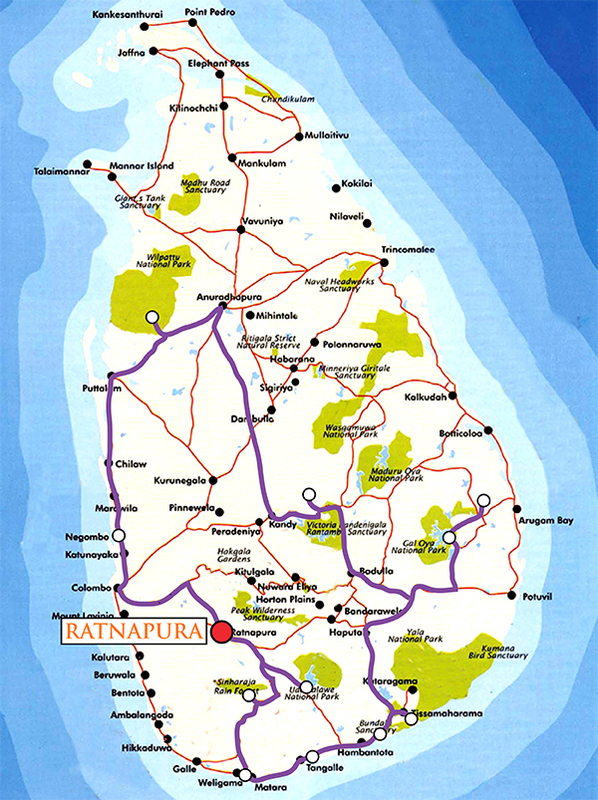 We left Ratnapura for the end to be the cherry on the top. It is a Mecca of the sapphire traders. Just after reaching the roundabout under the clock tower in the center of the village we were swarmed with local traders who presented their goods not understanding that what interested us were the minerals not the prepared products. 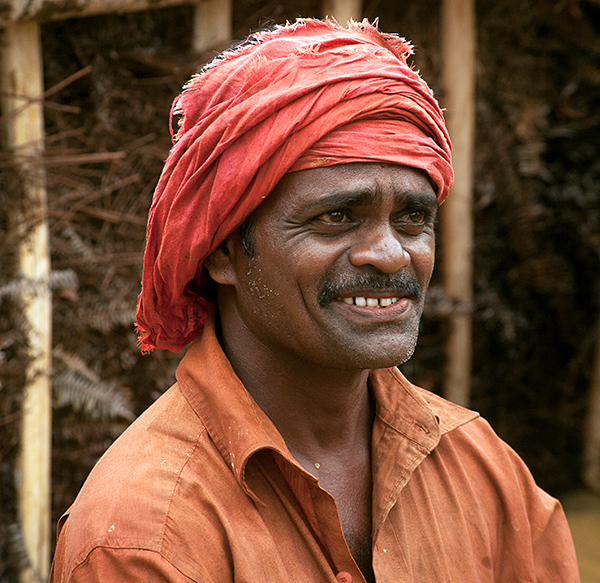 One of them offered to guide us to the mines and we eagerly accepted. 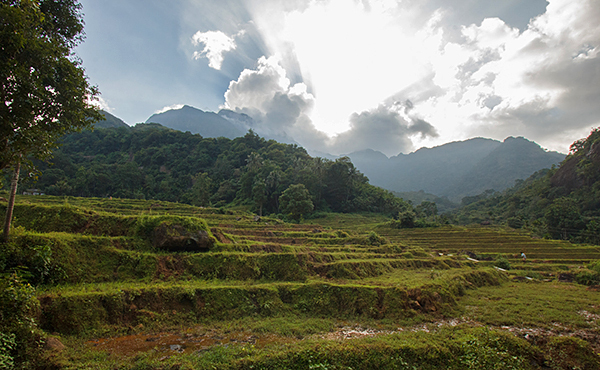 There are two ways to mine sapphires – directly from the river or on the rice fields – in both cases from the alluvial deposits. The mining from the river looks this way: one divides the river sideways into trapezoid-shaped sections. Layers of dirt, mud are removed until they reach a layer of gravel. After that, workers follow to another area, and a diver wired to a compressor enters the first one, reaches the depth of 6-15 m and mine the zones rich in gemstones. 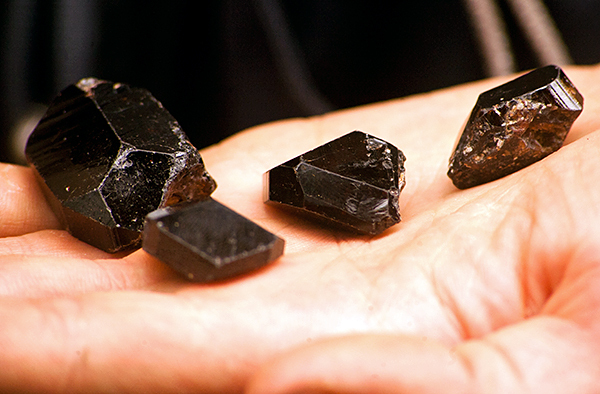 Vast majority of the content are worthless fragments of rocks, quartzes, less frequently tourmalines, spinels, rubies or sapphires. 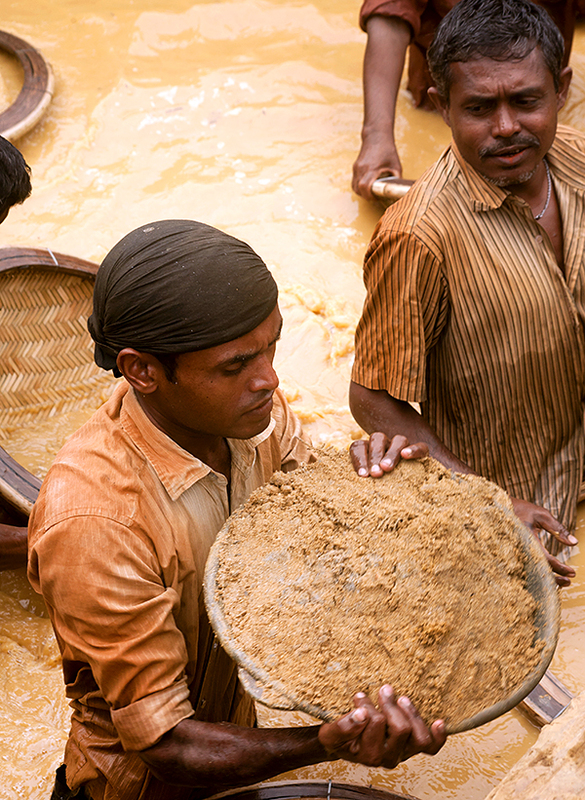 The minerals then go to traders who further process them. It looks a bit different with mines on the land. 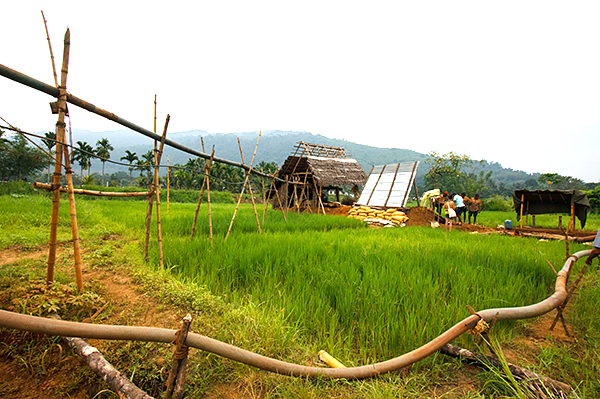 Mining also takes place in alluvial deposits where nowadays the rice fields are situated. Here the work is also divided in two stages. 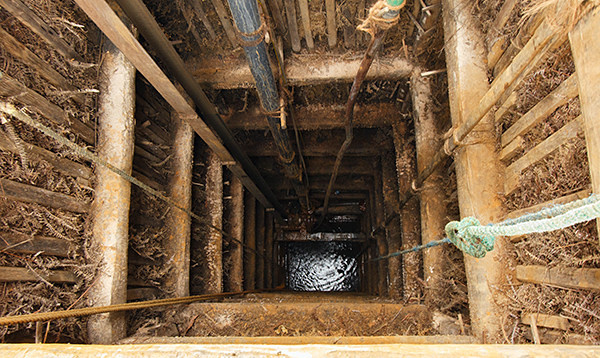 The first one is digging a well until one reaches the level of gravel (the same one as in the river). 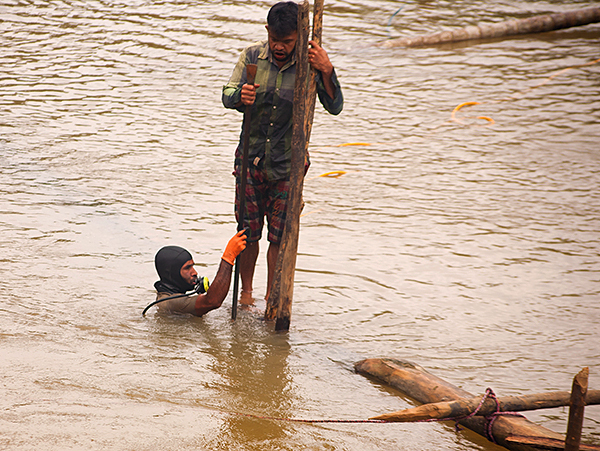 It is usually at depth of 30 m. After reaching garvel level the tunnels are dug. From them the gravel is taken to the surface. 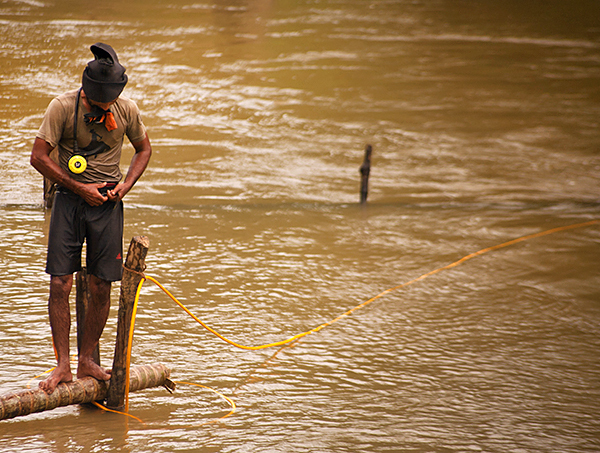 Water pump has to be working constantly as the tunnels are located under water table and they can be flooded very fast. All the gravel goes to a pit dug right next to the mineshaft. The operation takes around a month, right until the pit is full. 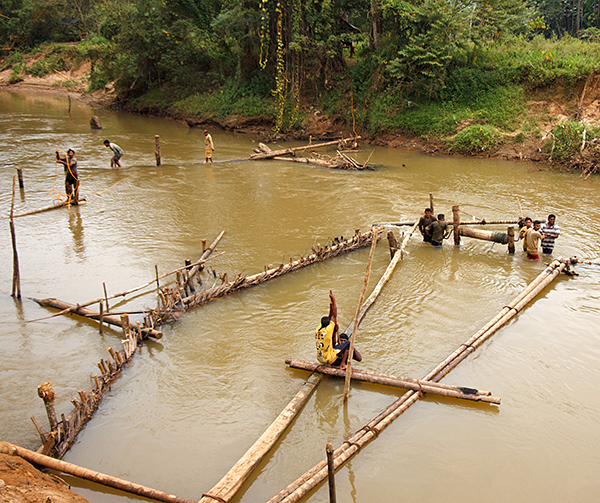 The next stage (which takes around three months) is panning the gravel in pans in another pit, covered with water and sorting the minerals from the gravel (similarly to gold panning). 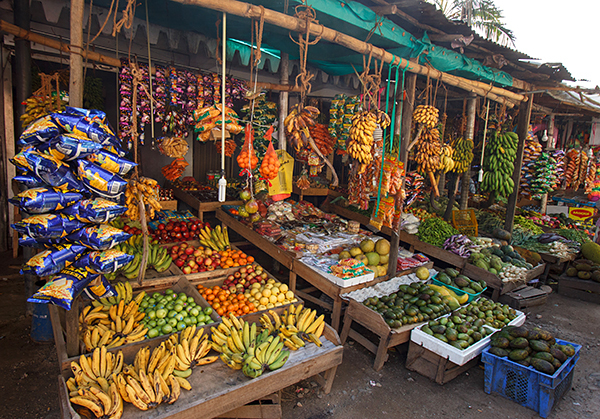 Later on, similarly as in the first method, the produce goes to the trader who processes it. 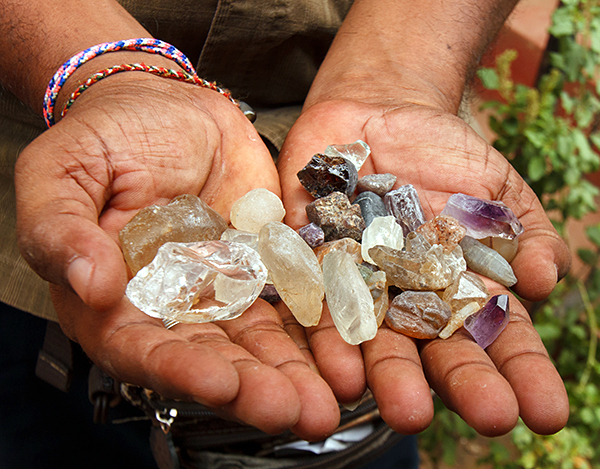 Both types of mining are a very hard physical work in difficult terrain, the remuneration depends on the amount of gemstones mined and is usually very low (especially if we take the work conditions into account). 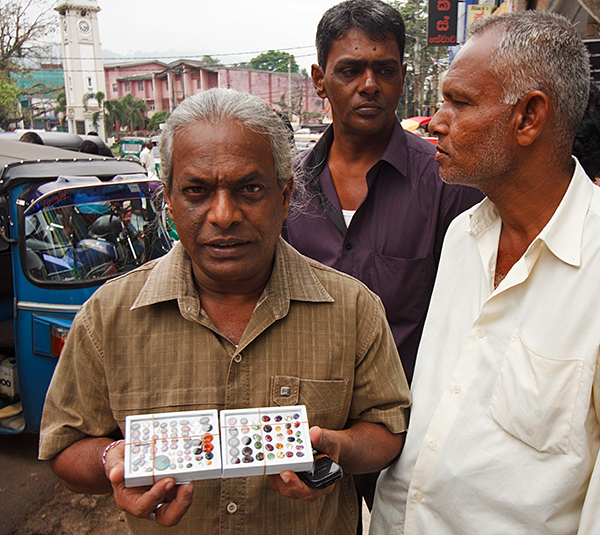 Gemstones depending on the quality are divided into groups, some are selected to be transformed into cabochones (some with cats-eye or asterism effect) which are manually processed on grinders (that resemble lathes) whereas the clear-gem specimens dedicated for ring, earrings etc. are processed on electric grinders. 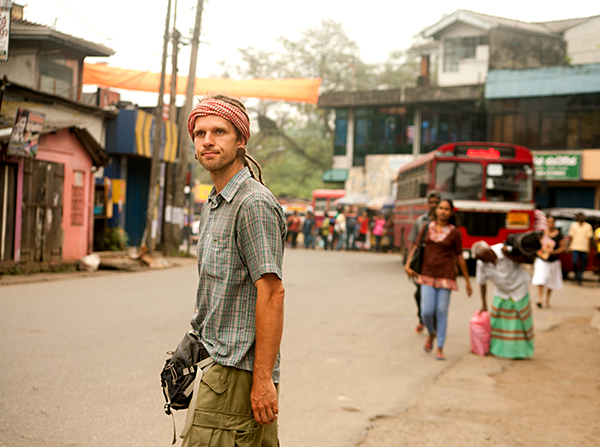 Marek on the streets of Ratnaputra. A. Bryja photo. 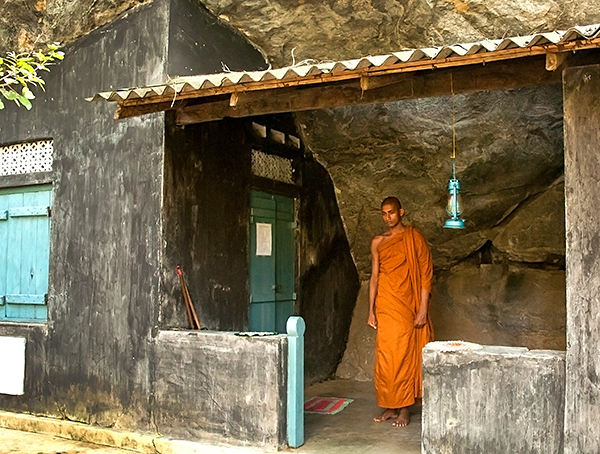 Monks in Ratnaputra. A. Bryja photo. Trapezoid-shaped sections where the miners work, they divide the river that way so they don`t work twice in the same place. M. Komorowski photo. Removing the upper layers of alluvial deposits. A. Bryja photo. The diver is about to go down to collect the gemstones. A. Bryja photo. 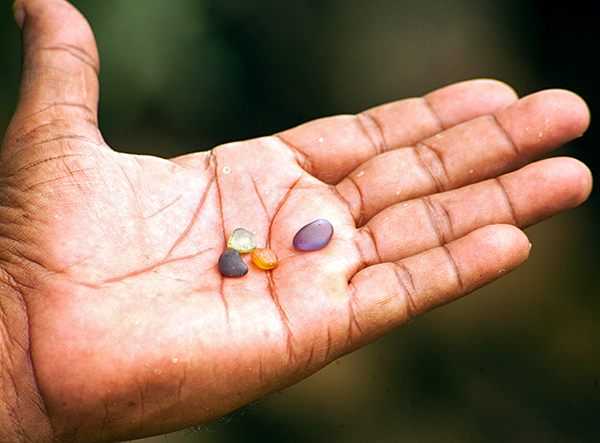 Diving in search of gemstones. A. Bryja photo. 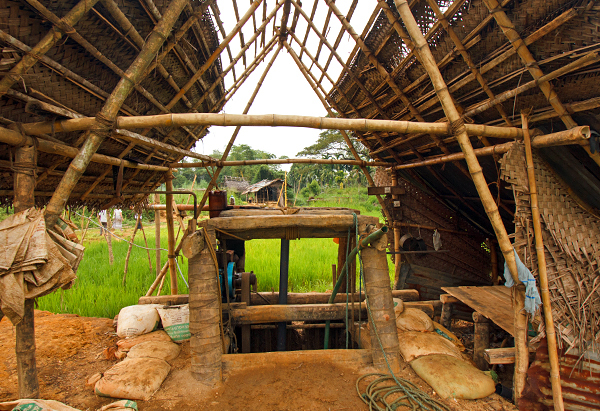 The second type of mining takes place in the ricefields, the wooden roofs shelter the wells from the rain. A. Bryja photo. 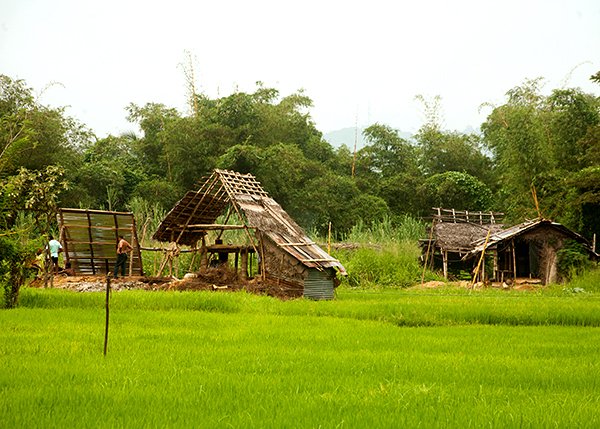 Mining constructions in the ricefields. M. Komorowski photo. One of the shafts. M. Komorowski photo. The shafts are areound 30 m deep. M. Komorowski photo. When the shaft reaches the gemstones rich zone the tunnels are dug. M. Komorowski photo. 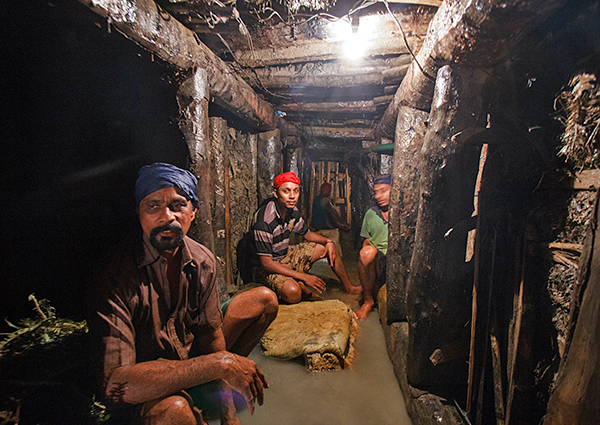 Tunnel dug in the gravel layer which is rich in gemstones. M. Komorowski photo. The material from the tunnels is transported into the surface. M. Komorowski photo. and later it is worked out in search of gemstones. M. Komorowski photo. Panning the meterial from the tunnels. A. Bryja photo. 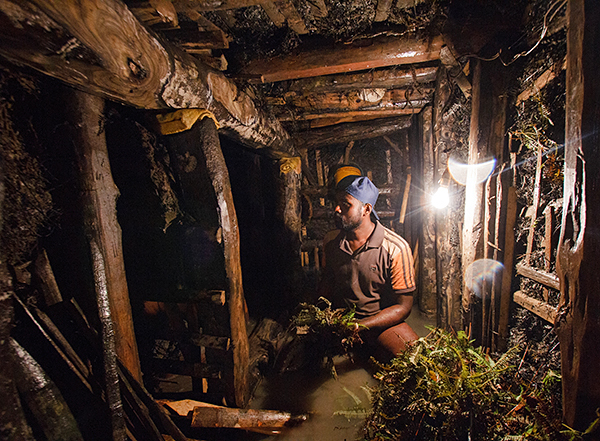 The miners, Ratnapura. A. Bryja photo. 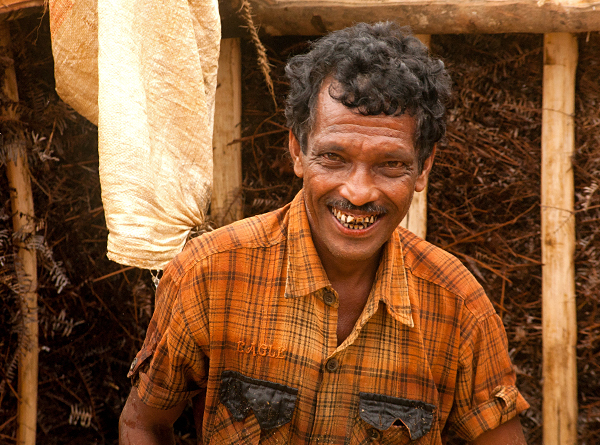 Miner, Ratnapura. A. Bryja photo. Marek examining the gemstones. A. Bryja photo. 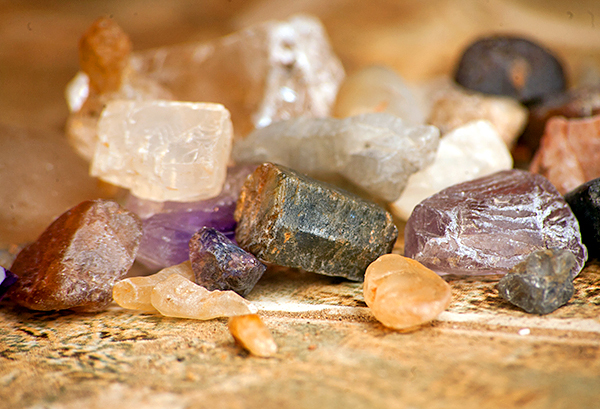 Different minerals found in the gravel layer including quartz and corundum. A. Bryja photo. 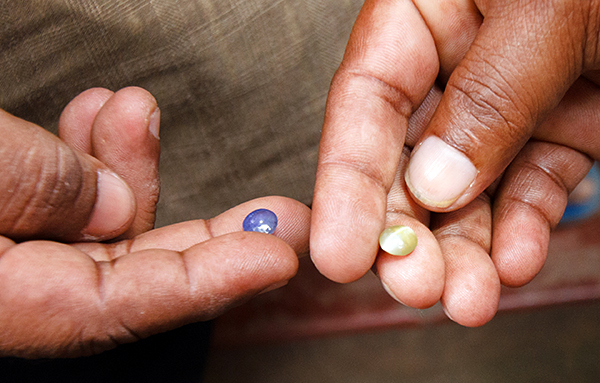 Gemstones found with a hard work. A. Bryja photo. 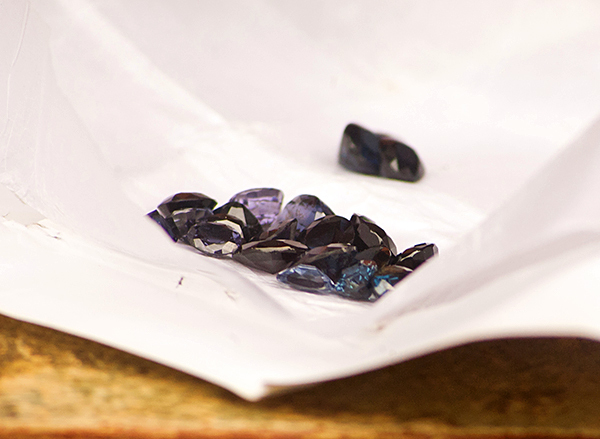 Gem quality sapphite crystal from the alluvial deposit. A. Bryja photo. 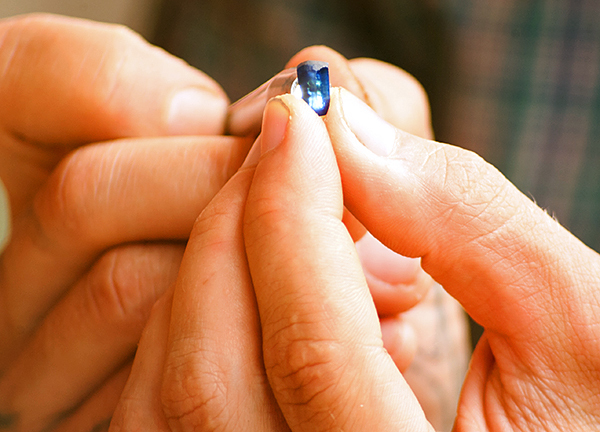 Clean gemstones rounded in the river, perfect to make the cut stones. A. Bryja photo. 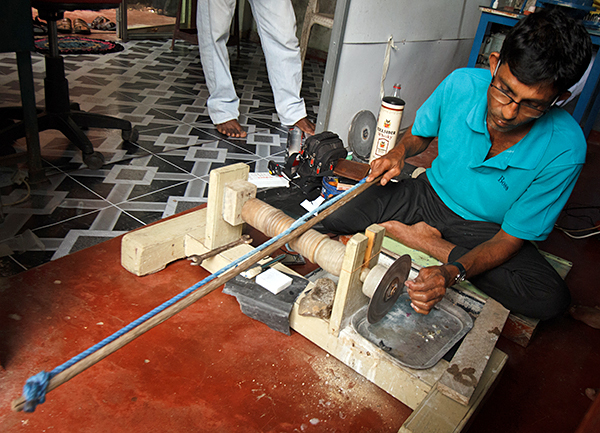 The manual grinders are used for processing some of the stones. A. Bryja photo. 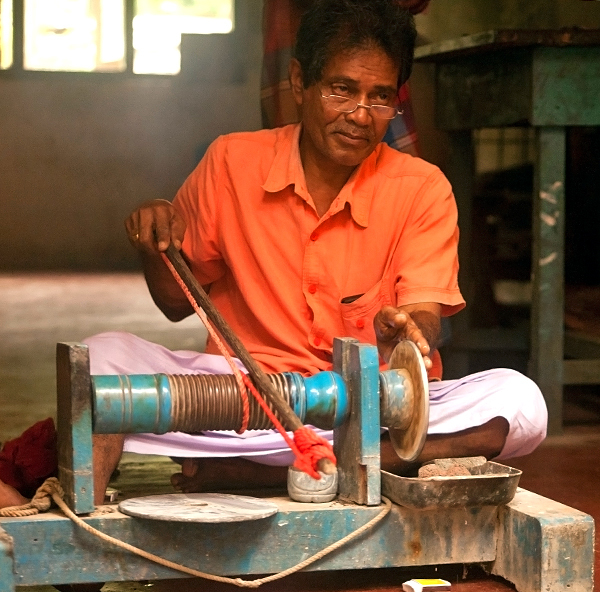 The manual grinders are used for processing some of the stones. M. Komorowski photo. 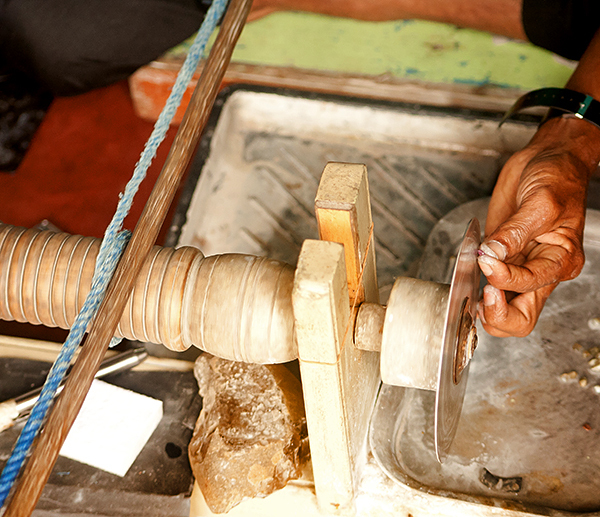 Manual grinder. A. Bryja photo. Stones after processing. M. Komorowski photo. Processed stones. A. Bryja photo. 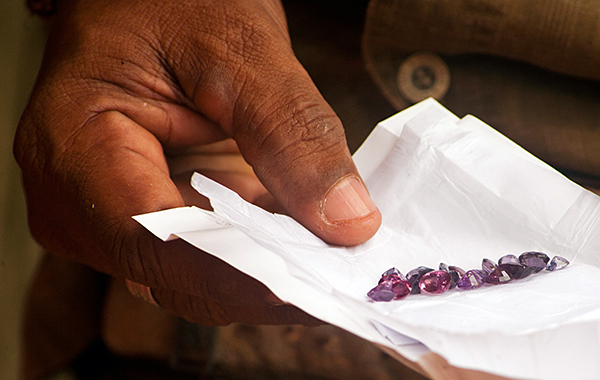 Processed sapphires. A. Bryja photo. And the last part - selling. M. Komorowski photo. This was the end of our journey in this beautiful country with kind and helpful inhabitants, incredible biodiversity, stunning landscapes and "nitro" buses. Be sure to visit it whenever you have the opportunity. 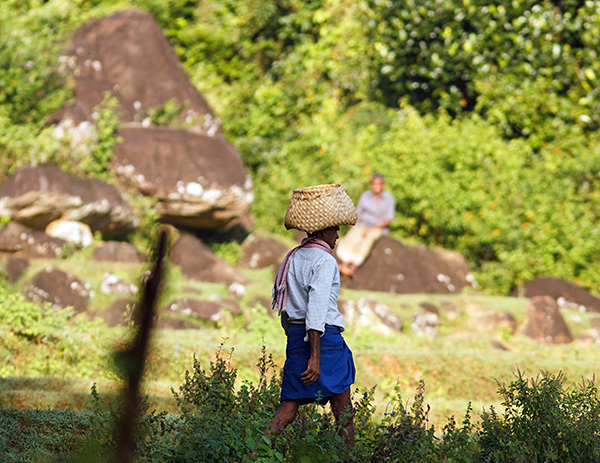 For me it was the best place I have ever been to (along with Cambodia – but this is the next story ...).